_In 2012, Livingston Sound began to investigate the possibilities of guiding a meditative experience through the single winding path of a labyrinth through an immersive sound field, tuned to the frequencies of the neighboring environment. 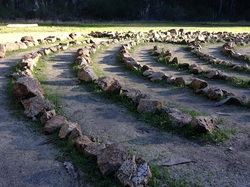 Labyrinths are a form of land art that is effective at shaping the way one experiences a landscape, while also transporting the visitor beyond the local into another realm. The sound design follows that same principle, to support a profound and introspective experience. Recently we have been creating immersive sound environments appropriate to the contemplative experience of traversing a labyrinth. After attending the World Labyrinth Gathering for an intensive overview of many labyrinth designs and experiences, it became clear that the fundamental goal is to shape and guide the experience of an individual traversing an outdoor pathway, pulling them away from the distractions of the world surrounding them, as a motivation to turn inwards and find healing, and this is exactly attuned to the way that Livingston Sound uses soundscapes to shape the exterior environment. We have built a laboratory for Labyrinth Sound in Santa Rosa, Calif, where we are testing the kinds of sound and the rhythms and harmonies most appropriate for the meditative experience. We have modules which surround the walker with the harmonies of each of the planets, plus the moon and sun, and also provide an immersion in crystal prayer bowls matched to the frequency of each chakra. We will continue with the recording of instrumental and natural sounds to mesh with the existing creations, in order to create an replicable product easily provided to distant clients. At the same time, much customization is available, to suit the size and character of your labyrinth or total garden space. We have also integrated lighting control systems to further complement the creation of an environment that is truly transporting. Finally, consider more sophisticated sound ideas for the commercial spa. Below, a Zen garden sound environment (it is recommended to listen at a low volume level to enjoy the subtlety). Our creative endeavors are closely tied to the richness of expression found in Asian string and wind instruments, and in a music that celebrates ties to the natural world, using wind and water and birdsong as an impetus to creative work. We are adherents of principles of wabisabi, a Japanese idea that celebrates the patina acquired with age, the irregularity of shape, the handmade, the unique. Despite being digitally controlled, our soundscapes are meant to sound handmade, as if a voice from the past, integrated with nature, and always fresh, attuned to the moment. The innovation by Livingston Sound is not just healing music, not merely a soothing background. It is a system that generates ever-changing soundscapes and integrates with the built space and natural environment. It is a customized, site-specific, computer-controlled system. Our creation is not just music, it is experiential, immersive, and generative (improvised in real-time for maximal variety). It has different spatial zones of activity and consists of instrumental gestures and naturescapes layered together. It is not just sound healing, but soundscapes for distraction, soothing, and motivation. It serves the concepts of “active design”: inducing, motivating and justifying visitor motion through the garden space. The soundscapes are rooted in nature recordings, made specifically for the project or drawn from our personally collected libraries of wind, water and birds. Original instrumental recordings are added, along with synthesis and sound design as appropriate for each space and its usage program. Every element of the soundscape can be individually adjusted (removing water, adding wind). The software has parameter controls, including density, volatility and diffusion. It can create evocative reverberation environments, helping to transport the listener to a more relaxing space. The software can perform real-time movable spectrum soundmasking, covering up machine and traffic noise. The soundscapes are not just aesthetic, but functional: they are immersive, mitigate traffic noise, offer wayfinding for the visually impaired. They are responsive: to a blue sky or cloudy day, rain or wind, physical presence and activity levels of visitors, pushbutton or web/mobile systems. They are interactive: responding to energy levels, inspiring energetic responses, or acoustically responsive. We call this ‘choreographed’ sound. There can be accessible musical instruments in the garden that connect to the system, equally available to children, Alzheimer's patients, and those with visual acuity or physical differences. The experience is distracting, soothing, motivational. The system is not just passive: it learns, adapts to the time of day, season of the year, usage conditions, user preferences. Like the popular Nest thermostat, it anticipates and offers a desirable response to conditions and habits. The audio is not delivered through fake rocks, but with innovative approaches to loudspeaker design, integrated into sculptural or ornamental elements, from metal spheres to birdcages to resonating chairs. The system can also be used to integrate coordinated lighting or fountain control into the garden experience. Garden soundscapes by Livingston Sound are an impetus to relaxation or to motion. The soundscape can be appropriate for a lingering garden, or for a strolling garden. The lingering garden invites repose, slows down the pace, encourages contemplation of a view. The strolling garden establishes a sequence of attractions pulling the visitor forward. A healing garden has usage programs that can be augmented with musical textures supporting the idea of using the garden in different modes. The strolling garden and its moving accompaniment can be a motivation to physical therapy work. The lingering garden and its contemplative soundings can invite the relaxation and mind- wandering that staff and patients may be seeking. With an increasing attention paid to patient and staff experience in the healthcare environment, an active soundscape is a necessary complement to integrated multisensory garden design. The sounds can be transporting to the visitor, creating a mental lift to oceanfront, sunrise on a ridge, or dusk in the desert. Properly integrated aesthetic elements sum up to create an experience that drives patient, family and staff satisfaction and contributes to the goal of total healing.